The California Car Cover Crew recently took a trip to the Petersen Museum to check out the latest exhibits. The world renowned museum has been given much praise since its grand renovation. If you have not been down to the Miracle Mile recently, it's definitely worth a trip. Starting in 2017, California Car Cover is now the Official Car Cover Provider of the Petersen Museum. We are glad to partner with the museum to preserve and protect their historic and rare automobiles down in the vault and while traveling to concours events. One of the most popular and visually stunning exhibits at the museum is the Precious Metal display within the Bruce Meyer Family Gallery. Ultra rare race cars, sports cars and classics all finished in silver make this one of the most Instagram worthy spots in the Petersen Museum. We sat down with Michael Bodell, Deputy Director of the Petersen Museum, to discuss the renovation and what’s in store in 2017. CCC: What has been attendee response to the museum thus far? MB: The response to the renovation has been excellent. We have exceeded all of our visitation goals and 97% of our visitors would visit a second time. CCC: What is your favorite car(s) on display at the Petersen Museum? MB: My favorite car is a Jaguar C-type, and the closest car we have to that in the museum is our 1956 XKSS, formerly owned by Steve McQueen. Cars from that era, especially Jags represent a time when race cars had to be on the road in order for the teams to compete and they are just works of art. CCC: Any interesting stories that our customers might enjoy knowing about the museum’s collection? MB: One of my favorite stories is actually of the Steve McQueen Jaguar. During Steve’s ownership of the 1956 XKSS, the police chief of Los Angeles has a free steak dinner to any officer that could give Steve a speeding ticket. Being that the XKSS was essentially a glorified race car and Steve drove it like that, no officer ever caught him and he remained the king of cool! CCC: What new exhibits or events are you looking forward to this spring or summer (that you are allowed to share with us)? MB: We’re opening Harley vs. Indian in early March and at the end of April, we’ll be opening 70 years of Ferrari. Both will be blockbuster exhibitions. CCC: How many cars are typically on display in the museum compared to being stored in the Vault? MB: It’s normally a 50/50 split. We have about 140 vehicles on display and another 140 in the Vault. 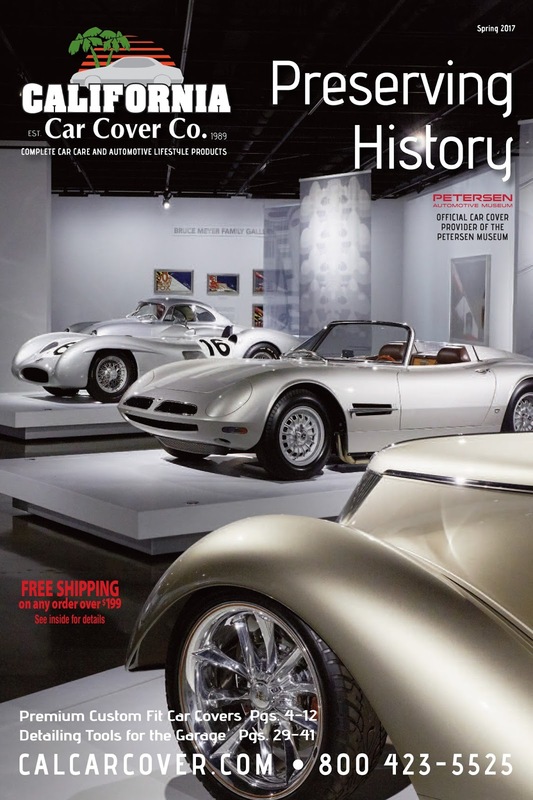 CCC: Why did you partner with California Car Cover as the Official Car Cover Provider of the Petersen Museum? MB: With so many valuable vehicles in the collection, the museum was looking for a quality car cover partner, and that partner was California Car Cover. Almost every day the museum receives new vehicles and is rotating vehicles in and out of storage. It’s so important to have good cover so the cars stay in the best possible condition when they’re being stored or transported. You cannot have a complete automotive museum without some hot rods. The Petersen Museum hosts a number of historic hot rods, including a number of past AMBR award winners. Rare and famed two wheelers are also on display at the Petersen Museum. Check out the rotating display of vintage concept cars from the Petersen Museum Vault. Since the museum is so close to Hollywood, there has to be space to display some of the most memorable automobiles from cinema history. The last stop on your visit to the Petersen Museum is the featured exhibit hall. This space is host to the museum's rotating displays throughout the year. On our recent trip, the Art of Bugatti collection was featured. It displayed not just a large group of stunning Bugatti automobiles, but incredible examples of Bugatti design from furniture to art. Check out the Petersen Museum website to see the latest and upcoming exhibits. If you live in the SoCal area, you can always drive over on a Sunday morning for their monthly Breakfast Club Drive-In Shows. In case you did not receive the March California Car Cover catalog in the mail, here is the cover image. Thank you to our friends at the Petersen Museum for their assistance with the photo shoot. This month only, we have lined Zerust storage bags on special at California Car Cover. Save 10% off on all of our lined Zerust storage bags for cars. Please visit our website for complete details. The offer is valid through February 28th, 2017. Zerust storage bags are a popular storage solution for any extended storage vehicles. These rust resistant bags are popular for our customers in the North and Northeast. If your garage or barn is not water tight and rust or corrosion is a concern, it might be time to consider a Zerust storage bag.